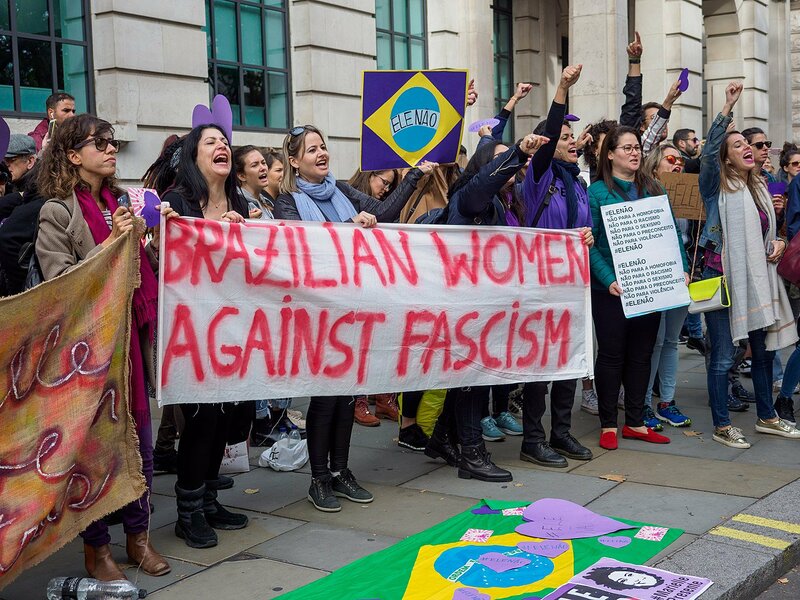 Opposing Bolsonaro’s attacks on human rights — Free Lula – Remembering Marielle Franco. Last week, on Friday, Owen Haisley was snatched by the Home Office when attending the Salford registration centre. Owen arrived legally in the UK in 1977, with his mother and sister, when he was just four years old. He has three children, all of whom have full British citizenship. He is a drum and bass/ jungle MC, music tutor and community worker (AKA Madrush MC), and has been part of the Manchester music scene for his entire life. He has been detained and is currently being held at Harmondsworth Removal Centre. Along with 50 other people, he is due for deportation to Jamaica on Tuesday 5th February – the day before the #Stansted15 sentencing. This is the first plane to attempt to deport people to Jamaica since the Windrush scandal. They will be escorted by large numbers of security personnel. There are more than 50 people who need our immediate support. 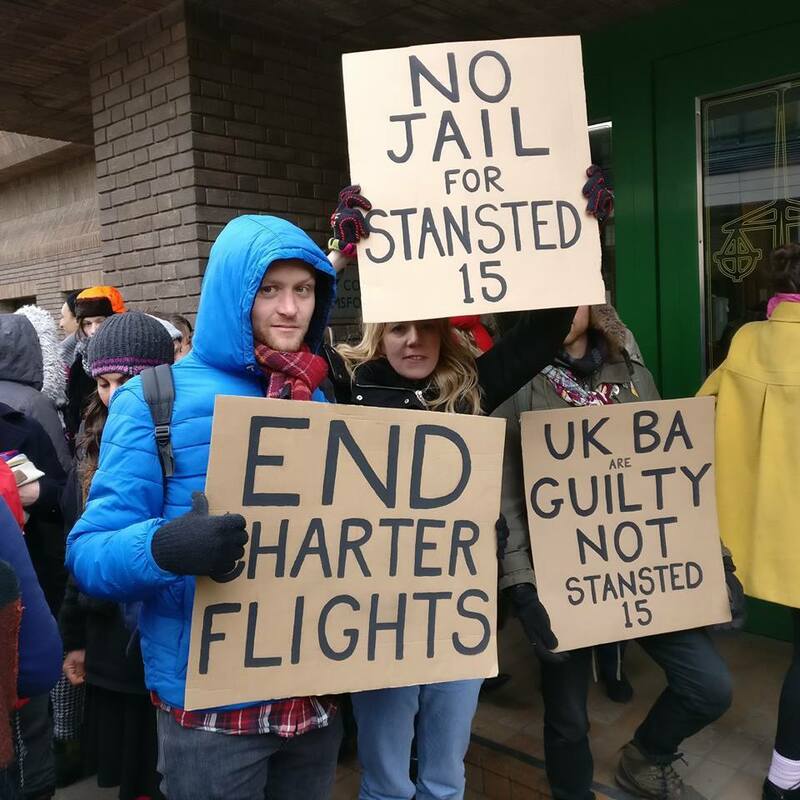 This Wednesday, 6 February, the #Stansted15 activists who bravely and peacefully protested a deportation flight, face their sentencing in Chelmsford at the Crown Court. Stand Up To Racism is supporting the solidarity protest called by End Deportations, from 8.30am, New Street, CM1 1EL. If you are able to get to Chelmsford to support the protest, contact us at info@standuptoracism.org.uk. But everyone can do something to show their support: download the ‘solidarity selfie’ poster HERE Whether in your workplace, college, community or just yourself, you can take a picture with the message of solidarity and share it including #Stansted15 and @AntiRacismDay. If you don’t have Twitter or other social media access, you can email it to info@standuptoracism.org.uk and we can share it for you. 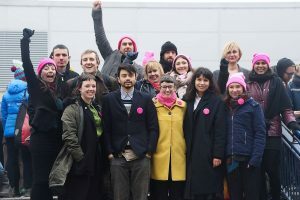 The #Stansted15 were found guilty in December of a terror-related offence after they peacefully prevented a secretive deportation flight from leaving last March. These activists are an incredible inspiration to millions of people who are enraged and horrified at the injustice of how refugees are forced to suffer at the hands of Fortress Europe and the British government’s ‘hostile environment’ that regularly sees parents stripped from their children, lives put in extreme danger as deportation flights take off to deport people, and the horror of life for those in detention centres. 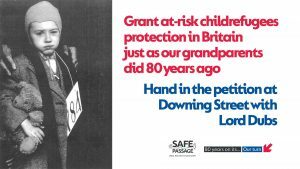 A petition in support of the 15 now has over 50,000 signatures – sign now to demand justice and an end to the Hostile Environment. 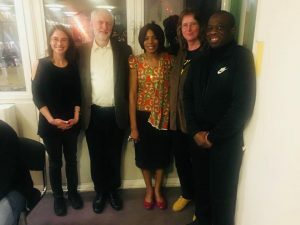 They now face an uncertain future, and the implications of the use of anti-terror legislation in this case poses a threat to the civil liberties and right to protest of us all. This sentence is intended to smash the anti-racist movement’s resistance to this government’s racist policies. They need the full solidarity of our mass, broad movement – we all must get behind them now to send the message loud and clear that refugees are welcome here, and that the charges against the #Stansted15 heroes must be dropped. The Education International, which is the global union federation for teachers around the world, is very concerned about news it’s been getting from the Philippines. 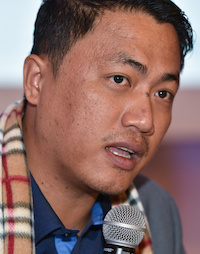 During a recent press conference, where the Alliance of Concerned Teachers was denouncing harassment and threats faced by its members and leaders, its general secretary, Raymond Basilio (pictured), received death threats on his phone. Raymond was warned that unless he gave in to the caller’s demands, an order to kill him would be carried out. The police deny any knowledge of this, but the union has learned of continuing unlawful profiling of its members carried out by the police in different regions of the nation, in a serious breach of both national and international law. Please take a moment and send a message to President Rodrigo Duterte demanding that the government protect Raymond and other union leaders, that they investigate the death threats, and that they guarantee the privacy of union members and stop any illegal collection of data about them. In March 2017, 15 people peacefully stopped a secretive deportation flight from leaving. After a 10 week trial they were found guilty of a terror-related charge. Join us outside Chelmsford Crown Court to stand with the Stansted 15 as they face sentencing and to demand an end to brutal deportation flights, inhumane indefinite detention, and the hostile environment. Solidarity with refugees and migrants: Stop the scapegoating! 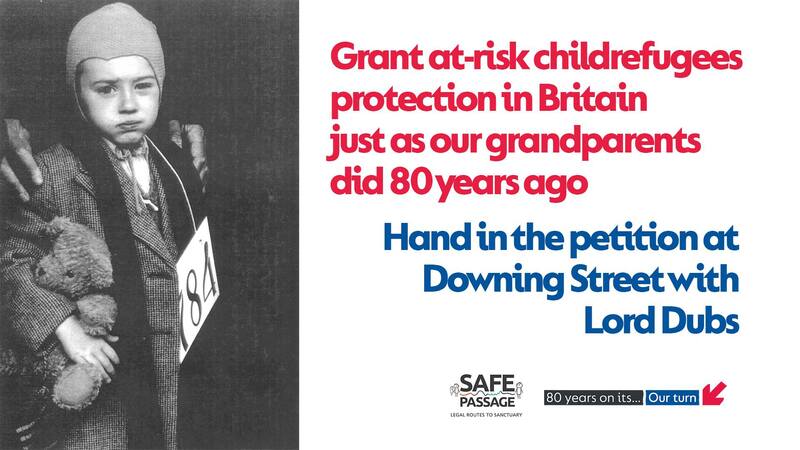 Join the protest at 6pm at the Home Office in London to protest in solidarity with refugees and migrants and to challenge the disgusting racist scapegoating being used by the Tory government and the establishment. Outside of London? Contact us if you are planning a local protest on the day in your town or city. The establishment has whipped up a frenzy of racism towards refugees and migrants after a hundred or so refugees were reported to have crossed the Channel since Christmas Day. This latest attack on refugees and migrants comes off the back of the Tories’ ‘hostile environment’ that has aimed to create a climate of division. Yet in reality, in 2015 1,015,078 refugees arrived in Europe, with more than 800,000 trafficked by sea from Turkey to Greece. Since then the numbers reaching Europe have plummeted. From the beginning of this year until mid‑September 20,120 arrived in Italy, down from 180,000 in 2016 and 20,760 arrived in Greece. 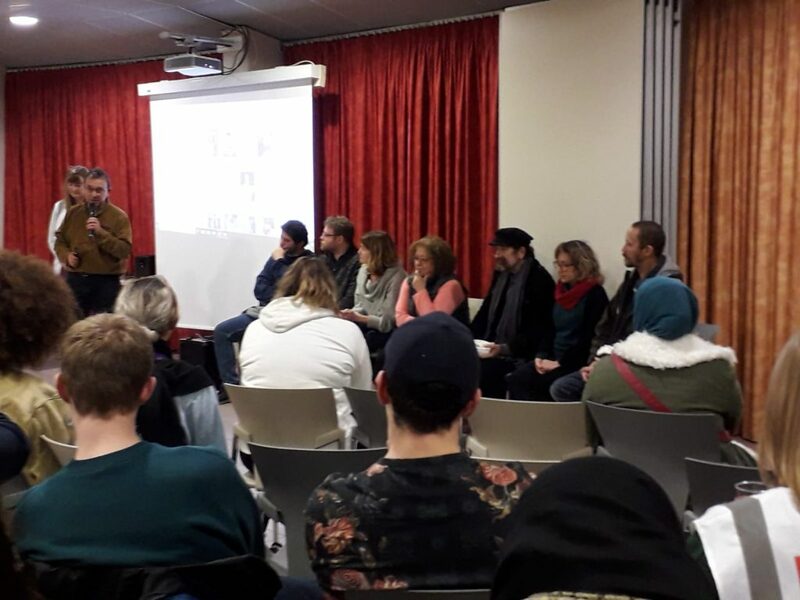 Around 90 volunteers travelled to Calais on Saturday for a weekend of solidarity with refugees organised by SUTR and Care4Calais. Despite torrential rain, all the refugee settlements in Calais had distributions, plus the large settlement at Dunkirk. Over 700 packs of winter clothing were distributed, plus hot drinks and snacks, haircutting, phone charging and wi-ii. SUTR groups came from Birmingham, Enfield, Haringay, Newham and South London, along with trade union delegations from Warwickshire NEU and a GMB delegation from London Region and North West/Northern Ireland region. We’re asking everyone to look in your cupboards for a winter coat you no longer wear. Last Monday the #Stansted15 were found guilty of a terror-related offence after they peacefully prevented a secretive deportation flight from leaving last March. The #Stanstead15 now face an uncertain future, and the implications of the use of anti-terror legislation in this case poses a threat to the civil liberties and right to protest of us all. This sentence is intended to smash the anti-racist movement’s resistance to this government’s racist policies. The #Stanstead15 need the full solidarity of our mass, broad movement – we all must get behind them now to send the message loud and clear that refugees are welcome here, and that the charges against the #Stanstead15 heroes must be dropped. 2. Write a letter in support of the #Stanstead15 to CPS, for the attention of Judith Reed, the deputy chief crown prosecutor for East of England. Send the letter by emails to eastofengland.inbox@cps.gov.uk, or post to:East Of England Complex Case Unit, CPS, County House, 100 New London Road, Chelmsford, Essex, CM2 0RG. 1. This was a politically motivated prosecution. 2. The charge was inexplicably changed from aggrivated trespass to endangering safety four months after the action. 3. The defendents must receive lenient sentences pending their appeal of the conviction. Emma, one of the activists, who is about to give birth must receive an absolute discharge. There must be no jail sentences for any of the defendents. 4. There should be a public inquiry into how peaceful activists came to be charged with a terror-related offence. We must receive confirmation that non violent direct action is not, and could not ever be, a terror related offence. 3. 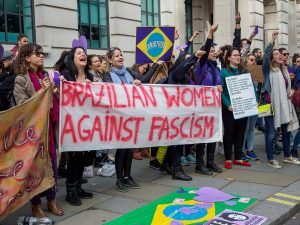 Join, share, invite and support the solidarity protest at the court on 4 February, where the sentencing takes place: 8.30 – 11.30am,Chelmsford Crown Court, New Street, CM1 1EL. 4. Is your local SUTR group organising/ involved with a local solidarity protest? Many are taking place already. 5. Take a ‘solidarity selfie’ with a message of support and share on social media with #Stanstead15. You can do this yourself, with work colleagues, in your union branch, college, community, with friends, family etc. 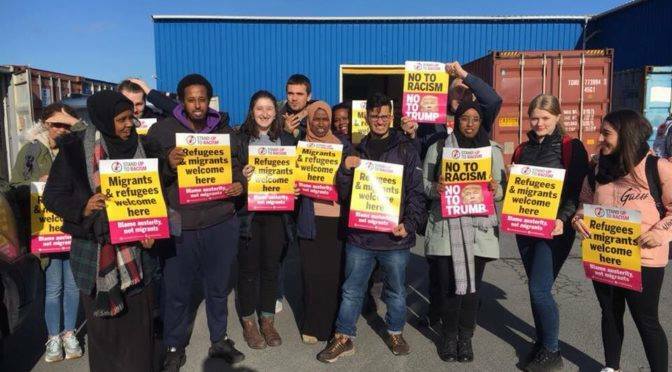 You can email any messages of solidarity or ‘solidarity selfies’ to info@standuptoracism.org.uk and we can pass on the the #Stanstead15 or share for you. 6. Can your local Stand Up To Racism group invite a speaker from #Stanstead15 to your next meeting/ rally/ protest?